Wendy Lee Oldfield graduated from ISA in 1999, having spent grades 6 to 8 at the old A.J. Erntstraat ISA campus, and then grades 11 and 12 at ISA’s current location. After leaving ISA, Wendy studied graphic design at Chapman University in California, graduating with a Bachelor of Fine Arts in 2004. Since then, she’s co-authored two books on creativity; Caffeine for the Creative Mind and Caffeine for the Creative Team. She has also worked on a number of design projects for brands such as Google, Blizzard Entertainment, Pepsi, Chipotle and the NFL. Two years ago, Wendy joined a tech startup in Southern California as Design Director, allowing her to work with “a wonderful team of fellow designers, videographers and creatives,” a role which she thoroughly enjoys. Wendy has fond memories of her time at ISA including “the great group of friends I made”, which helped Wendy feel welcome and less isolated during her senior year at ISA. Pictured above are Wendy and her husband in the art room during their recent visit to ISA. Juha Virtanen attended ISA from 1998 to 2004. After leaving ISA, he obtained his bachelor’s, master’s and doctoral degree from the University of Kent where he is now a Lecturer in Contemporary Literature at the School of English. At the University of Kent, Juha primarily specialises in innovative British and Irish poetry, but he has also designed and taught modules on materials such as graphic novels. In addition, he is currently serving as the School of English’s Deputy Director of Education, as well as the programme director for Kent’s Master’s degree in The Contemporary, which is an interdisciplinary programme taught jointly by the University and the Institute of Contemporary Arts in London. Juha is a published poet; his first collection Back Channel Apraxia was published by Contraband Books in 2014, and his chapbook –LAND was published through Oystercatcher Press in 2016. His most recent book, Poetry and Performance During the British Poetry Revival 1960-1980: Event and Effect was published by Palgrave Macmillan in 2017 and examines intersections of poetry and performance during the British Poetry Revival. In 2018, his work was included in the international anthology Wretched Strangers: Borders, Movement, Homes. He is currently researching women poets published in British little magazines, and is writing a new series of poems called Doom Engines. Rather than setting out to directly follow a particular career path, Juha believes that his line of work allows him to pursue some of his deep-rooted interests in a unique way. After obtaining his bachelor’s degree, Juha felt as though he wasn’t done with studying, so he went on to obtain his master’s, and after gaining his doctorate, he was lucky enough to be hired as a lecturer. He considers each step along this path to have been shaped by meeting individual goals rather than following a defined life path. His proudest moments have included receiving his doctorate, being hired as a lecturer, and seeing his work published. More importantly, he is always moved when he sees his students thrive with their own idiosyncratic interests. He is also very proud of DATABLEED, an open-access poetry journal which he co-edits with his partner, Eleanor Perry. In autumn 2018, they are launching DATABLEEDER, a series of poetry and performance events based in Canterbury, Kent. While Juha attributes all of his English teachers with furthering his passion for literature, it was his theatre classes that proved to be a life-changing experience. It was during these classes that he first encountered Bertolt Brecht, a German playwright and poet, who remains an influential figure for Juha’s views on literature and art. 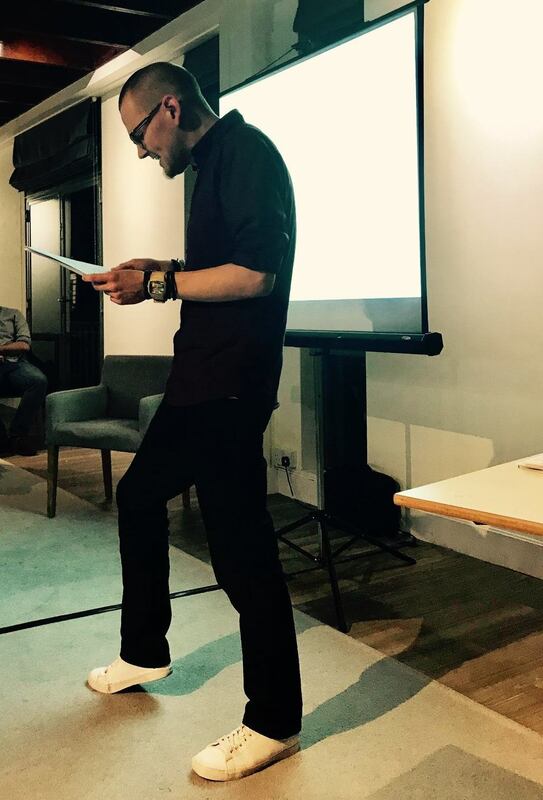 Even to this day, whenever Juha has to deliver a lecture, present a paper at a conference, or do a poetry reading he utilises the concentration and breathing techniques that he was taught during his ISA play rehearsals.